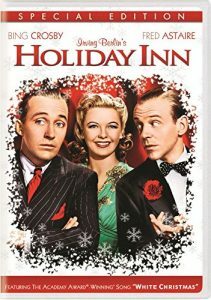 In 1942, Fred Astaire and Bing Crosby teamed up at Der Bingle’s Paramount Pictures for Holiday Inn, a black-and-white musical that proves more entertaining than Crosby’s color semi-remake White Christmas in 1954. Astaire and Crosby play partner/rival song-and-dance men who compete for the hand of their performing partner, played by Virginia Dale. After Crosby loses, he moves to the Connecticut countryside where he creates a resort that is only open on holidays and puts on the shows with the help of Marjorie Reynolds. Dumped by Dale, Astaire makes a drunken arrival at the inn on New Year’s Eve and dances with Reynolds. He decides she’ll be his new partner, but doesn’t remember what she looks like, setting off a frenzied search at every subsequent show while the once-bitten Crosby does his best to steer him off track.